coefficient of variation (CV) calculator - to find the ratio of standard deviation ((σ) to mean (μ). The main purpose of finding coefficient of variance (often abbreviated as CV) is used to study of quality assurance by measuring the dispersion of the population data of a probability or frequency distribution, or by determining the content or quality of the sample data of substances. The method of measuring the ratio of standard deviation to mean is also known as relative standard deviation often abbreviated as RSD. It only uses positive numbers in the calculation and expressed in percentage values. Therefore, the resultant value of this formula CV = (Standard Deviation (σ) / Mean (μ)) will be multiplied by 100. CV is important in the field of probability & statistics to measure the relative variability of the data sets on a ratio scale. In probability theory and statistics, it is also known as unitized risk or the variance coefficient. 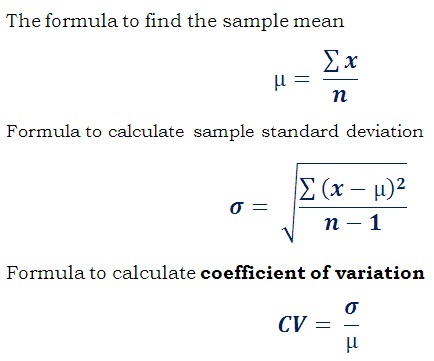 The below three formulas are used to find the standard deviation, mean and coefficient of variation to measure the relative variability of data sets having different mean and the unit scale. How to calculate coefficient of variation? 1. Calculate the mean of the data set. 2. Calculate the sample SD for the data set. 3. Finding the ratio of sample standard deviation to mean brings the CV of the data set. The below solved example with step by step calculation illustrates how the values are being used in the formulas to calculate the coefficient of variance. The relative variability calculation is popularly used in engineering, physics, chemical industries etc. to employ the quality assurance. Therefore the coefficient of variance or relative standard deviation is widely used in various applications across the different types of industry. Any manual calculation can be done by using the above mathematical formulas. However, when it comes to online to measure the relative variability, this coefficient of variation calculator makes your calculation as simple as possible for the given sample data of the population.